Trigonometry is about angles and triangles, there are relationships between the angles and the ratios of the lengths of side of the triangles. These ratios are represented by functions such as sine and cosine, which occur widely in mathematics and physics, even in fields which don't initially appear to be related to physical triangles. For most cases we only need to consider traditional trigonometry based on a circle so feel free to ignore the hyperbolic trigonometry column. Hyperbolic trigonometry starts to become useful when we have a space with the Minkowski norm: (x²-y²) the simplest case is the two dimensional space represented by double numbers as explained here. This is a summary of the results in the above pages, for the derivation of these formulae see the links above. 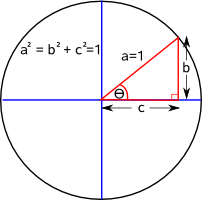 Here we will use a unit circle, that is a circle where all the points are exactly 1 unit from the origin, which gives: b²+c²=1. Here we will use a hyperbolic function where the minimum distance from the origin is 1 unit which gives: b²-c²=±1. This is half the product of two sides and the sin of the included angle. 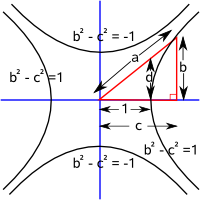 We can derive the double angle from products above where A=B. From this we can then derive the half angle formulae. 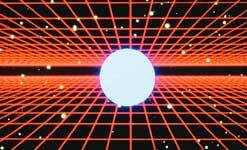 arc sine, arc cosine, arc tan, etc. On this page we discussed how to represent and evaluate functions. It is not always apparent that the three angles to specify a rotation are not independent of each other and must be applied in a certain order. For example imagine that we are aiming a dish at a satellite. The azimuth and elevation are independent of each other, for example we can aim south and then elevate up by the required inclination, or we can set the elevation and then turn and point toward the south. However there is a third angle, we can rotate about the line to the satellite, to correctly align with the horizontal and vertically polarised signal from the satellite, this third angle is dependant on the others so we cant escape from this issue. 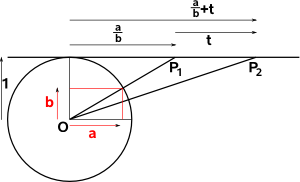 When the angles are small, then they are nearly independent of each other, for example if we are aiming at a small area of sky.